Ill. Hort. Misc. : 59 1861. Big Nolina flowered after 20 years. On the left is Pachypodium lamerei. Origin and Habitat: Tamaulipas, Veracruz, and San Luis Potosí in south-eastern Mexico. Altitude: 100-2800 metres above sea level. Habitat: Grows together with Mammillaria vallensis, Mammillaria anniana, and Neobuxbaumia euphorbioides. Beaucarnea recurvata f. variegata hort. Nolina recurvata f. variegata hort. 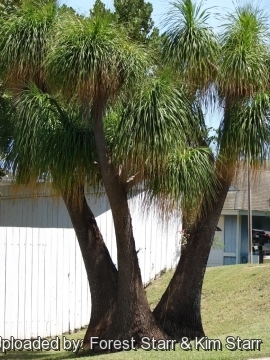 Description: Also known as the “Pony Tail Palm” or “Bottle Palm” (though it is not a true palm) Beaucarnea recurvata was introduced into cultivation from Mexico about 1845. It is a dioecious, evergreen, succulent tree up to 9 m tall (but rarely more than 1,20 to 2,50 indoors) with a very noticeable swollen base that tapers up to a slender trunk that ends in a head of green and recurving foliage. It is a slow-growing very peculiar species often seen as a houseplant, that people either love or hate. Stem: Juvenile plants are single-stemmed with a bulbous base that start thickening at an early seedling stage, forming soon a neat, firm, rounded caudex and the small plants are pulled underground by contractile roots. Mature specimens produces a stout caudex up to 3,60(-4) meters in diameter, most of which is above ground, with one or more branched trunks. 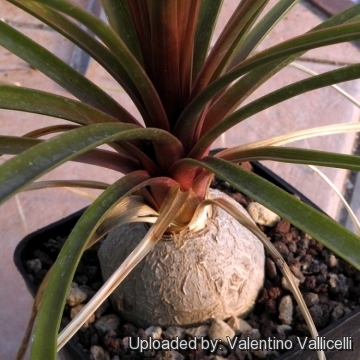 The caudex can store water up to 1 year. Leaves: Strap-like, grass-like, thin, flat narrow, dark green, 90-200 cm long and 1-2,5 cm wide that form clumps at the ends of the branches and droop down. The cascading nature of the leaves gives much the appearance of a pony’s tail (hence the common name). 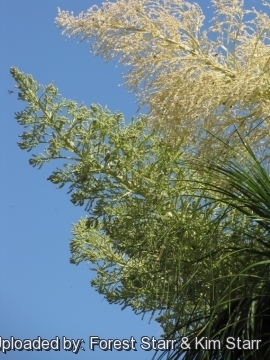 Inflorescence: Large, pyramidal shaped panicles 75-110 cm tall at the branch tips. Blooming season: Flowers occasionally once plants mature (often when it's 20 years old or more) and then in late spring or summer for several weeks. 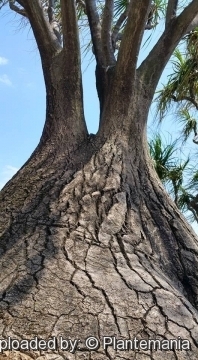 The tree will occasionally flower two or even three times a year. Fruit: reddish winged fruit with 2-3 seeds. 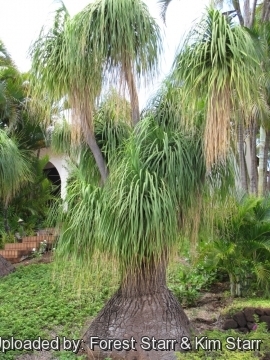 Beaucarnea recurvata Lem. : is a dioecious succulent tree up to 9 m tall with a swollen base tappering up to a slender trunk that ends in a head of green and recurving foliage. Distribution: south-eastern Mexico. Beaucarnea recurvata f. variegata hort. : has dark green leaves margined with cream coloured edges. 2) Wikipedia contributors. 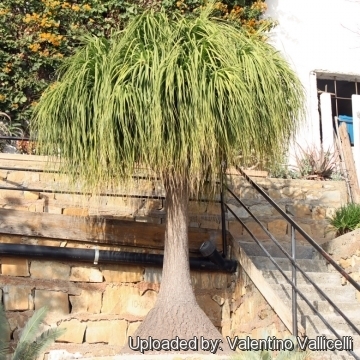 "Beaucarnea recurvata" Wikipedia, The Free Encyclopedia. Wikipedia, The Free Encyclopedia, 18 Dec. 2014. Web. 31 Dec. 2014. 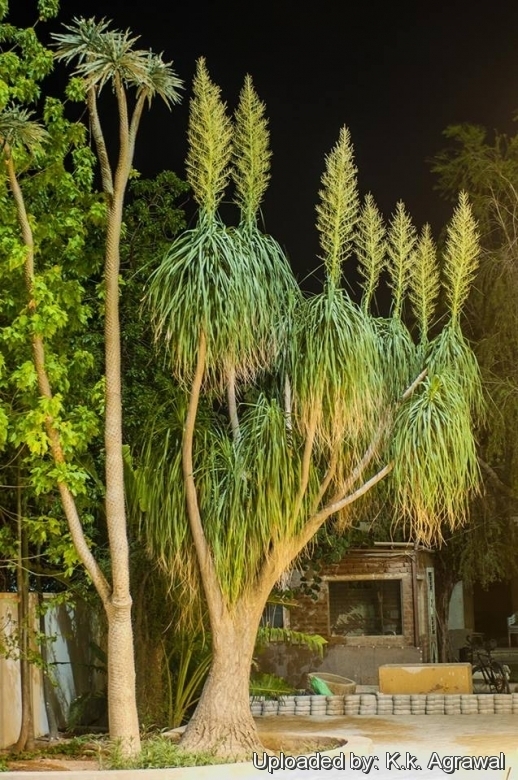 Cultivation and Propagation: Beaucarnea recurvata are related to False Palms (Yucca species) and need similar care, they are among the easiest “palms” to grow indoors as houseplants, and outdoor as ornamental plants in temperate climate gardens. The plants are very slow growing, so don't expect great growth spurts from year to year and very drought tolerant, give them lots of sun to light shade, well drained soil mix and water deeply but infrequently in summer and fertilize them only once during this period. 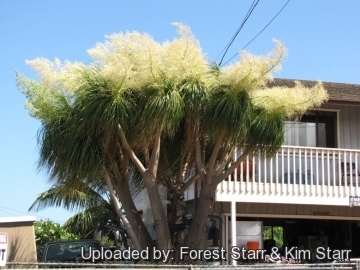 During the winter months, the plants are watered only enough to keep the foliage from wilting. Over-watering is the most frequent cause of failure when growing Beaucarneas. They are pretty resistant to rotting if all other conditions are good. Indoors they are often grown in shallow pots, with a tuft of strappy green leaves emerging from a bulbous stem that seems to erupt from the soil. It is a plant for people who don't want a lot of work taking care of their plants, as it seems to thrive on neglect , and indoors are manageable in size if kept in a small pot but need a good amount of direct sunlight through the window. The plant is quite hardy and can even stand frost (-7 C). Maintenance: Remove older leaves that start to become yellow or brown and cut off the spent flower stalk. Leaf tips have a tendency to dry and be brown in the house, so if possible place it outside in the summer. 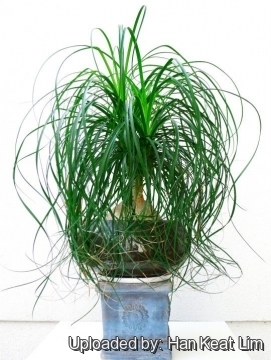 Pest and disease: Bugs, mealy bugs and mites usually are not a problem with the Beaucarnea, however if they do appear, simply spray the houseplant down with a soapy water mix twice a day until they are gone. Propagation: Cuttings and seeds. Seed is sown in the spring and will germinate at about 20° C.
Use: It is often used as specimen container plant, near patios, or placed in rock gardens for its irregular outline or silhouette, it is also suitable for growing indoors.